A fantastic live release - an essential purchase for all Ayreon fans. For over 20 years, Arjen Lucassen’s band Ayreon has existed purely as a studio project with no live shows. The reason for that is because he always thought a live show would be impossible to do – the albums typically have a dozen or so singers, who generally have their own bands, so whilst getting them to record vocals separately for a studio album works, getting them all together at the same time for a live show is a lot harder. Despite that, in 2016 Ayreon announced 2 live shows, which sold out in seconds, and a third date added sold out the same day – thats 9000 tickets sold with no publicity other than a post on facebook and email to people on the Ayreon mailing list. So what had changed? Well, in 2015 a show had been put together called The Theater equation – an adaptation of Ayreon’s Human equation album. While not a true Ayreon show, Arjen Lucassen got involved late on and was so blown away by the reaction of fans that he decided the time had come to do a full Ayreon show. The shows at 013 in Tilburg saw an all-star cast with a band of talented musicians plus an incredible sixteen singers. The singers were… Floor Jansen (Nightwish), Damian Wilson (Threshold), Hansi Kursch (Blind Guardian), Tommy Karevik (Kamelot), Marco Hietala (Nightwish), Jonas Renkse (Katatonia), Mike Mills (Toehider), Anneke van Giersbergen (The Gentle Storm), John ‘Jaycee’ Cuijpers (Praying Mantis), Marcela Bovio (Stream of Passion), Irene Jansen, Robert Soeterboek (Star One), Edward Reekers (Kayak), Jan van Feggelen, Maggy Luyten (Nightmare) and Lisette Marije (Scarlet Stories). All have appeared on Ayreon albums over the years but this was the first time they’d all been gathered together like this. The backing band was impressive too, featuring 8 musicians – Ed Warby (drums), Johan van Stratum (bass), Marcel Coenen (lead guitar), Ferry Duijsens (guitar), Joost van den Broek (keyboards), Ben Mathot (violin), Jeroen Goossens (flutes, woodwinds) and Maaike Peterse (cello). The shows were an incredible success – I had high expectations based on the people involved, but it exceeded my expectations with the music, vocals, visuals etc all fantastic. Now they’re releasing the shows on CD and DVD. ok taking the CD version first, the audio quality is superb, so it’s a fantastic live album. Most people though are likely to be more interested in the DVD. The shows were filmed from multiple cameras – in the photo pit, the audience, on stage and drum or keyboard mounted cameras. The video quality is generally very good – the only criticism is that at times some of the footage seems over-exposed, possibly where people are in the spotlight. Unlike the Theater equation DVD though it’s in focus, and the cameras are steady. Another area which was awful in the Theater equation release was the editing, but thankfully this time there arent rapid fire camera angle changes that distract from the action, instead where camera angles change, it’s done sensibly – so you don’t for instance get a closeup of a singer during a gutiar solo, the focus is always on the most important elements. As a result it’s a pleasure to watch and you’re able to relax and enjoy the show. They had a tricky balance – focus on closeups of the performers, or go for wider shots that show the spectacular visuals on the giant LED screen behind them, and have chosen to mainly concentrate on the performers but there are enough wide shots to show the visuals and the pyro effects. I’m glad that in the DVD, they’ve kept in the part where Arjen Lucassen gave his speech to the audience – some live releases would have cut that out, but I think it’s an important part of the show as he talks about putting the shows on despite the fact he’s got bad stage fright and hates public speaking. It’s a well put together package – the audio is perfect, and the video is generally very good, and it’s been great to watch the show and it brought back memories from the night. The show itself though is just part of the package. The DVD release has two discs – the show is on the first disc, with the second disc containing 20 minutes of so of highlights of the try-out show, which was basically a live rehearsal in a smaller venue without the pyro, screens etc. There’s also a behind the scenes feature which is almost an hour and a half long and is an interview with Arjen Lucassen and Joost van den Broek, the two men responsible for the shows, talking about the whole process from the initial idea right up to the shows themselves. Interspersed with that are live clips and short interviews with the cast. It’s a really well done feature – it gives you a lot of information and is really enjoyable and interesting to watch. 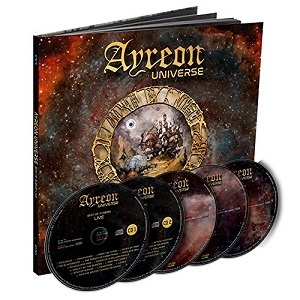 A fantastic live release – an essential purchase for all Ayreon fans. Ayreon Releases First Full Live Video ‘For Everybody Dies’ from Ayreon Universe DVD – Pre Order Now!